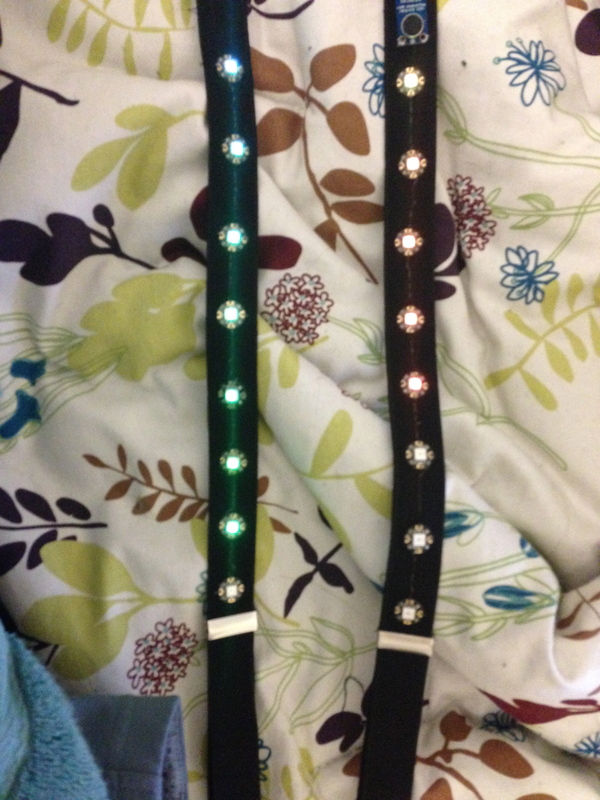 I made a rainbow led belt! Went into the lab today to finish up the led belt I started yesterday. Yesterday, I sewed it for a couple hours, measuring out the fabric, folding it in half, sewing it, trimming off the excess, then folding, sewing, and trimming a second time so that the fabric would be stable and not too transparent. I then slipped in the weatherproof led strip (which was the larger strip shown in one of my previous code test videos), and decided to call it a night. Today, I went back, and tried on the belt. Realizing it was much to wide to fit in belt loops, I sewed the facbric sleeve as narrow as I could get it around the weatherproof strip. 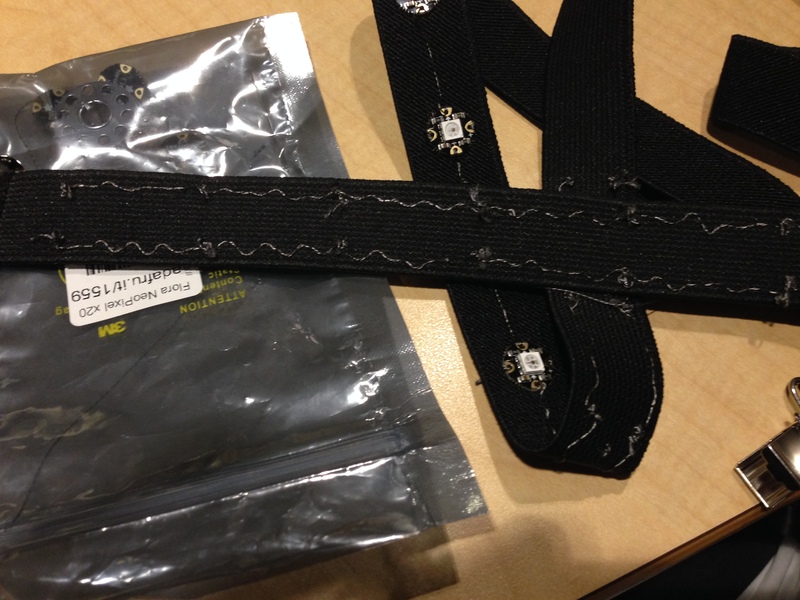 Then I glued velcro onto my second squarewear and the fabric, and hooked up the led strip. It’s really quite pretty. My only complaint is that the code is not very responsive to the light sensor at all, but I went back and looked through the code, and couldn’t figure out why. 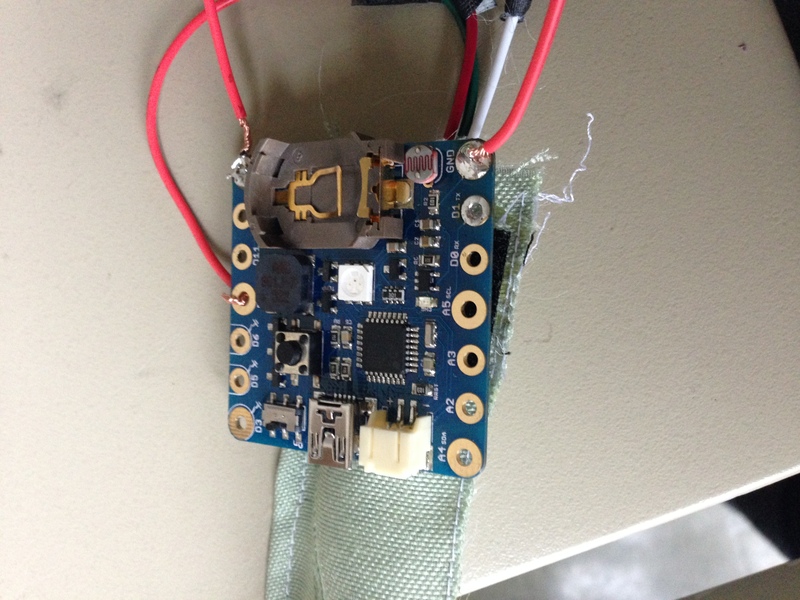 I went in to TA hours last night, and soldered some of the connections to make them more secure. But after doing this, my suspenders were still being very glitchy. As an attempt to make some connections more reliable, I decided to try painting a few of them with conductive paint. 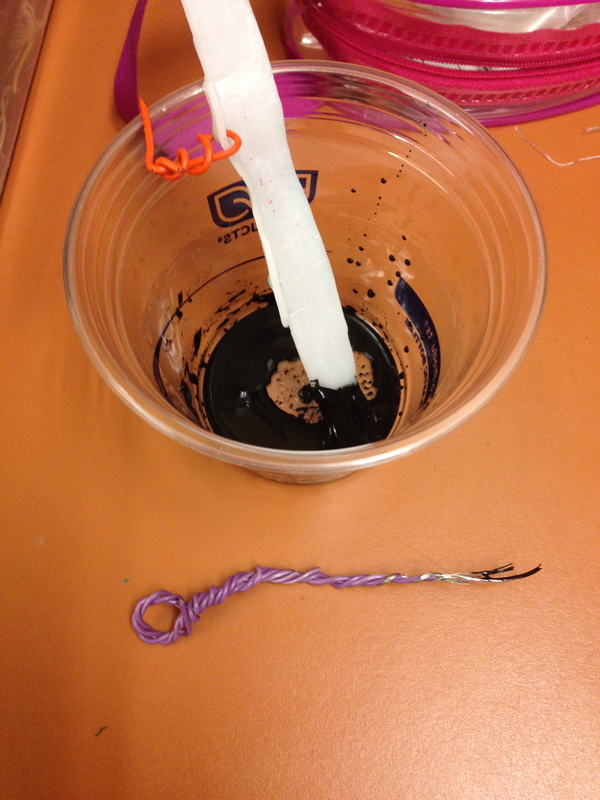 However, there are no paintbrushes in the lab, so i went rummaging around and made a paintbrush out of some braided wire. I sat working in the lab today from 1:00 pm to 6:15 pm hand-stitching together the suspenders. 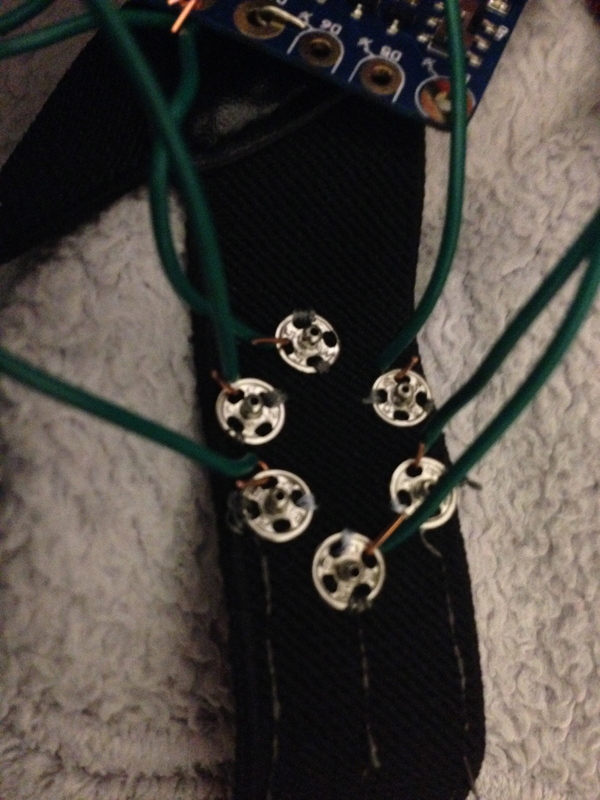 I used hand-stitching to tack lines of conductive thread from the chains of rgb leds to the Squarewear I am using as the main open source hardware for the project. (http://www.adafruit.com/blog/2013/11/27/squarewear-2-0-arduino-compatible-wearablewednesday/) To attach the conductive threads to the squarewear without crossing them, I sewed on some small metal snaps, and tied the conductive threads to these snaps. I then connected these snaps to the proper pins on the Squarewear using some wire I cut and stripped with scissors. 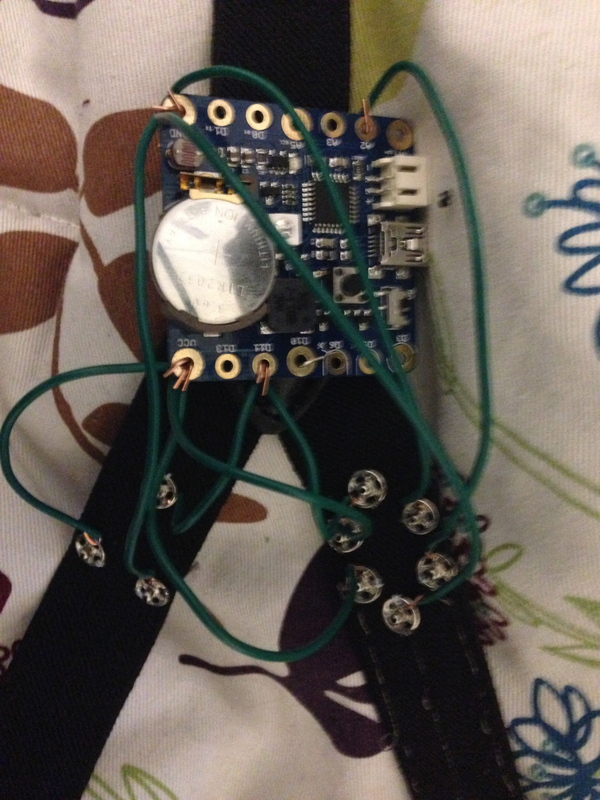 As a result, the circuit for the suspenders is now complete, though it’s very glitchy and temperamental. I will post a video of the suspenders soon. It’s taking a really long time to stitch all these LEDs together into a chain on the suspenders. In addition to attaching them to the suspenders themselves, (which took about 6 hours), I have to hand sew connections between the LEDs, which requires three lines of conductive thread connecting all the LEDs. This probably took another 5 hours…. 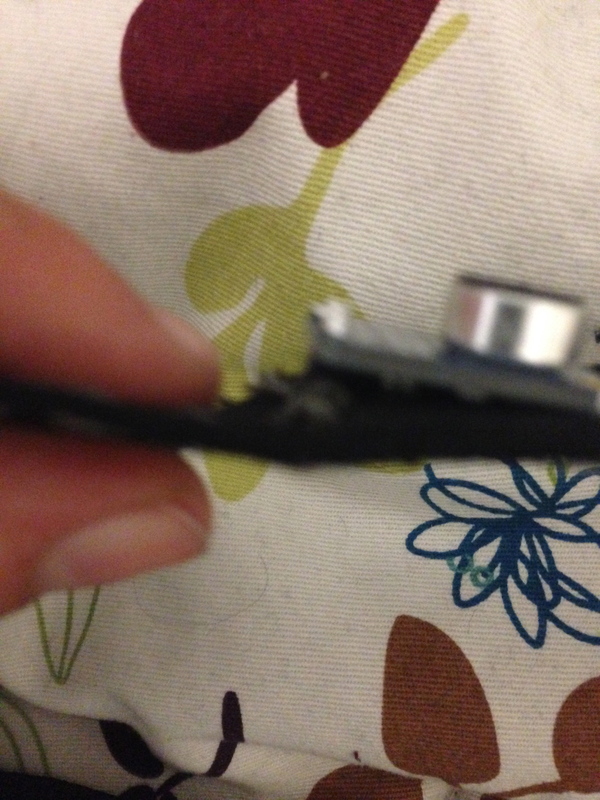 Edit: I’ve discovered that a lot of the connections I made between leds on the front of the suspenders unraveled. A good way to secure knots it by covering them with clear nail polish, which did manage to save some of my connections, although I ended up having to redo half of them. Finally Got My Code to Work!!! I finally got my rainbow cycle code to work properly with the microphone input. It’s really sensitive now and reacts really well. I’d altered the code, and worked with my professor to try to work out some bugs. Today, we figured out that the soundSensed program I copied from some old code took too long to spit out information to properly work with the altered led code to get the light strip to respond better with the sound sensed from the microphone. I’ve sent the code to my professor, and plan on working with her to get all this sorted out tomorrow. 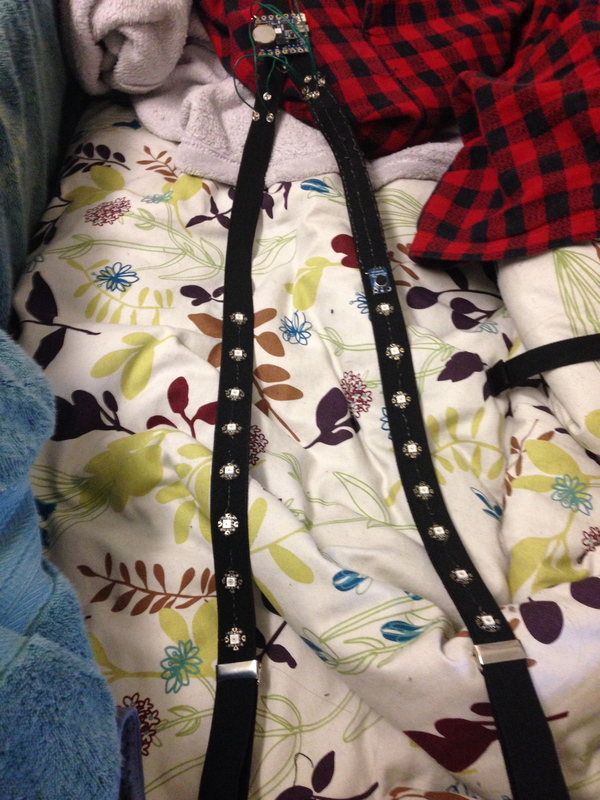 Still having problems with my code, but I’m off for Thanksgiving break, and I decided a good project to take with me was sewing the leds onto the suspenders, thus beginning construction. 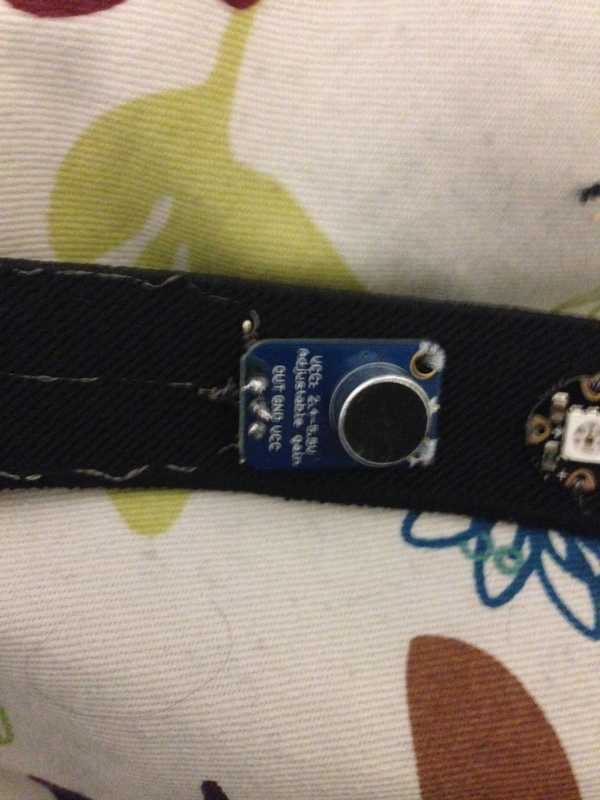 I’d originally intended to use a Neopixel led strip from Adafruit, but then realized that the suspenders are elastic, and need to stretch, but the continuous led strip of made of a plastic, which understandable has no give in it at all. 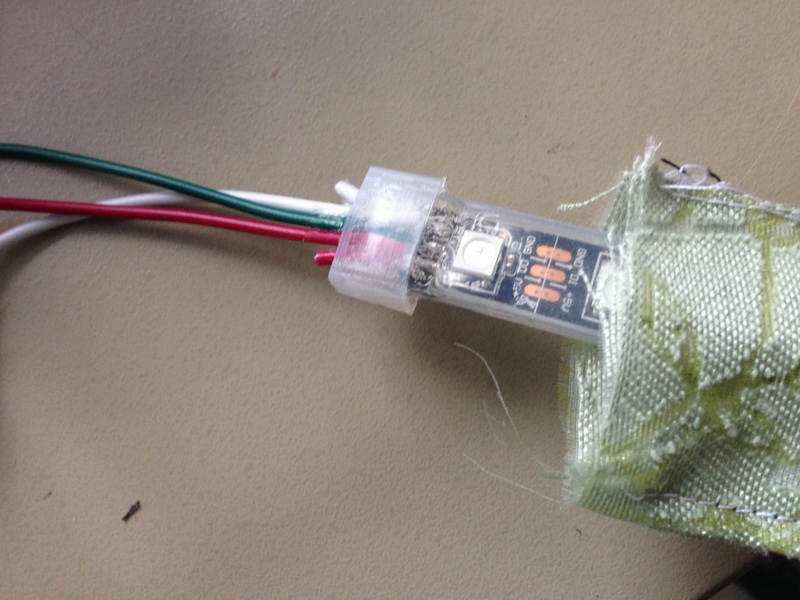 Luckily, when ordering supplies I’d ordered a few of these Neopixel flora individual leds intended for wearable projects. (http://www.adafruit.com/products/1260) Sewing these on individually will not prevent the suspenders from fitting properly. However, these pixels are rather costly, and come out to be about $2 each unless you are ordering massive quantities of them. Edit: I had not expected how long it would take to sew these pixels on. Although they look quite nice, in total it probably took me about 6 hours to sew all 16 pixels onto the suspenders.